These fully assembled 20.5 in. mahogany church chairs are loaded with style and features to provide the best experience possible for your sanctuary seating. Each church chair features a 4 in. thick, 2 lb. density, 100 percent virgin, moisture resistant polyurethane molded cold cured foam seat and a moisture barrier fabric to provide protection against spills and help prevent stains. These church chairs include a comfortable cut-away back, 16 gauge textured black powder coated steel frame with enhanced rocket glides on each leg to protect floor surfaces, welded ganging devices for attaching chairs together in rows, T-NUT construction connecting seats and backs to frame (stronger than wood screws), and a durable plywood base for both seats and backs. 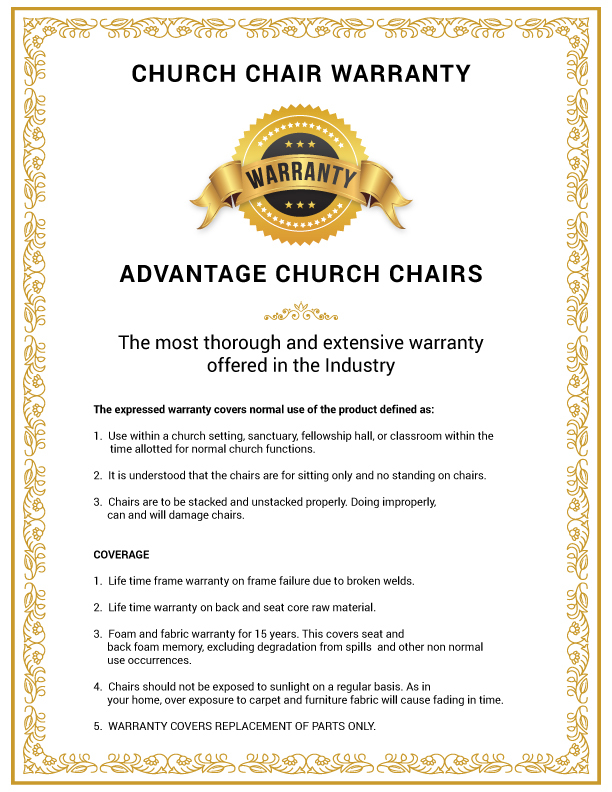 These church chairs for sale from Advantage Church Chairs include an impeccable warranty and are tested to last through the years. Each church chair is SGS tested and approved for up to 4,000 lbs. and includes a 15 year normal use warranty on foam and fabric with a lifetime warranty on frame failure due to broken welds. 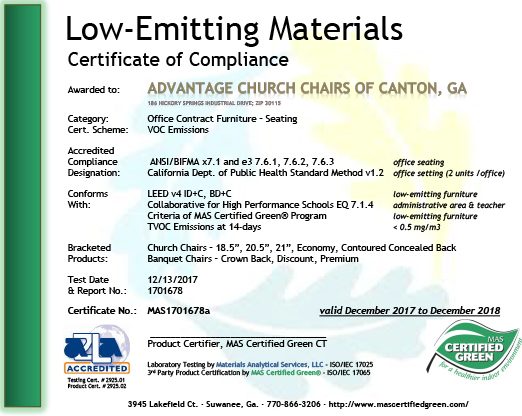 The fabric of these church chairs is durable enough to withstand 200,000 double rubs (Wyzenbeek test) and the foam and fabric meet flame retardant specification CA117.